Across the United States, LOCUS estimates that $9 trillion will transfer from one generation to the next by 2029. When you dig into the numbers, it’s clear that communities – rural and urban, wealthy and poor – have assets. The challenge for community philanthropy is how to turn that wealth into what a community really needs: housing, healthy food, education, childcare, a growing economy. Place-focused foundations have made great progress towards capturing “just five percent” of that wealth. One example is the Central New York Community Foundation’s Five for CNY which challenges residents to leave five percent of their estates to their hometowns. In Nebraska, a similar effort, started in 2002, increased planned gifts to the statewide foundation by $55 million. One Nebraska town, Shickley, and its 337 residents, built an endowment of over $2 million and expects another $2 million in planned estate gifts. That’s a lot of money to support early childhood education, playgrounds, and training. What if communities, inspired by Shickley, successfully tapped into that looming transfer of wealth? If community and other rooted foundations managed to capture just five percent of that $9 trillion over the next decade, what should they do to put those assets into productive use for America’s communities? Of course, foundations could do much more of what they do now – make more and larger grants to desperately needed community causes. It could also mean greater support for community amenities and quality of life initiatives. But, with significantly larger endowments foundations could explore emerging roles like economic development and local impact investing. There is another compelling reason for community philanthropy to start doing things a little differently. Foundations are entering what the Chronicle of Philanthropycharacterized as the “windfall years,” receiving more estate gifts from the Silent Generation and Baby Boomers. According to the Federal Reserve, just under half of Americans’ wealth is held in their businesses and their homes. The fear is that as older Americans die, and their assets are dispersed, much of the wealth will follow their children, in some cases leaving the community. How can local and regional foundations provide leadership to keep some of that wealth invested in the community from where it came? 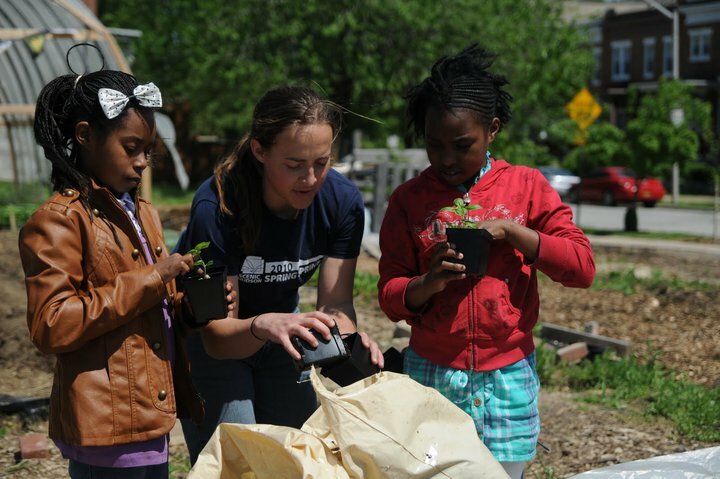 Baltimore Community Foundation provided a bridge loan to Healthy Neighborhoods, a local CDFI, to help “green” the historic Reservoir Hill neighborhood. The plan for the neighborhood includes increasing the tree canopy, expanding community gardens, and rehabilitating vacant lots. Fortunately, there are foundations out there creating a way to keep wealth local. One leading example is Baltimore Community Foundation which has committed to investing four percent of its endowed funds directly into Baltimore. They believe they can match or beat the returns their fixed income assets are receiving in the market. Because they were inexperienced in investing locally, they decided to start by working through Community Development Financial Institution (CDFI) partners, who are already experts in this business. “We didn’t have anyone working in this area before, but people from all departments stepped up,” said Patti Chandler, the foundation’s Vice President of Finance and Administration. The foundation is now searching for opportunities that provide both social and financial returns in its own neighborhood. The foundation has also connected with regional grant makers and anchor institutions that are interested in promoting a local capital ecosystem. “This is still early discovery for us, but we know that we can be a significant contributor in strengthening prospective borrowers,” said Chandler. The foundation has deployed $1 million in local impact investments supporting affordable housing and community facilities. They are particularly interested in investments that support wealth creation through small businesses and home-ownership. “BCF is trying to improve education and neighborhoods,” says Chandler. “Economic opportunity is a critical component of success. This is an area where leveraging both grants and investments could really make a difference in Baltimore.” Over the next few years, the goal is to deploy a total of $6 million in local impact investments. That’s more than twice as much money as the foundation’s endowment typically generates for grant making annually. What’s most remarkable about these investments, though, is that they are doing double duty. They are supporting valuable community work and they are earning a financial return which then creates grant dollars to support other critical community needs. The community foundation’s donors have been fully engaged in the process. Since endowed donor advised funds are invested in the same pool as discretionary endowment, they automatically participate in the foundation’s four percent commitment. Donors will also have the option this year to allocate a portion of their non-endowed donor-advised funds to the growing and diversified local impact investment portfolio. In communities like Baltimore, families now have the option to make gifts that are invested in their hometown to support their hometown. Imagine if this became accepted – and expected – practice among place-focused foundations. While community philanthropy has a remarkable opportunity over the next decade to capture “just five percent” of that $9 trillion transfer of wealth, donors and community partners might want to encourage their foundations to “just investfive percent” in their hometowns. – Travis Green and Deb Markley are part of the Local Impact Strategy Solutions team at LOCUS, helping place-focused foundations create greater impact through mission-aligned local investing.